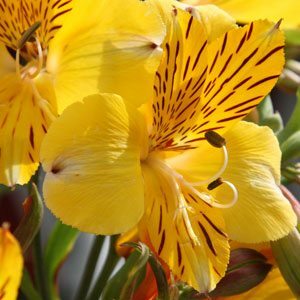 Alstroemeria is commonly called the Peruvian Lily orLily of the Incas. Flowers resemble a miniature lily, and because of long vase life are popular as cut flowers. Guaranteed to to add colour to the garden, these are reliable flowering plants and with so many colours available they are real winners as cut flowers. Look for species and varieties including A. aurea, A. pulchella (Parrot Plant ), Alstroemeria Regina, Alstroemeria ‘Red Baron’. Dwarf cultivars known as ‘Princess Lilies’ are a wonderful low growing plant and will reach only 15cm in height.. The trumpet shaped alstroemeria hybrid flowers range in colors from white through to yellow and scarlet on long stems, yes they are a great cut flower. Alstroemeria do require good drainage, to prevent diseases. A ph of around 6 is ideal. No really specific fertilisers seem to be available so use an all purpose slow release, or the same fertiliser you would use for carnations. Extreme heat will may a little wilt and perhaps leaf burn. Alstroemeria are also not very frost tolerant. Pests include aphids and thrips. Position – Sunny to a little shade. More shade in warmer climates and protection from mid summer afternoon sun is ideal. Fertiliser – Use an organic fertiliser in spring. Mulch – In spring mulch around plants to maintain moisture and a cool root run. Drought tolerant – Yes once established and if well mulched.